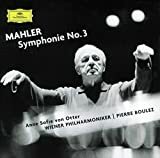 Mahler's Third Symphony, a gargantuan affirmation of life is, I believe, his longest symphonic journey. He wrote that it "begins with inanimate nature and ascends to the love of God," and, I might add, puts in just about everything in between. The Third Symphony declares in its closing choral section a "Joy, deeper still than heartache!" This is, in fact, "heavenly joy." Yearning is not insatiable; it is fulfilled in "a blessed city." Music can hardly aim higher than to express these things. Mahler fascinates endlessly because he attempted the ineffable. When I heard the National Symphony Orchestra under Iván Fischer perform this work in 2008 at the Kennedy Center, I experienced an interpretation that aimed at a jewel-like, refined beauty. It toned things down a bit to achieve this. On the other hand, a few years later in London (October, 2010), I heard Vladimir Jurowski and the London Philharmonic Orchestra give the Third a more full-throated, rambunctious approach that may be closer to the heart of this phantasmagoric music. On Friday evening, November 6, 2015, in the second of three performances by the NSO at the Kennedy Center, I expected Christoph Eschenbach’s Third to come somewhere in the middle of these two interpretive stances, with most likely a lean in the Jurowski direction. I am not sure what I ended up getting. In the first and longest movement, Eschenbach kept the line, which is an accomplishment in itself with this sometimes fragmentary music, but it was as an unbroken succession of often delectable moments, beautifully played by the NSO. However, Eschenbach’s signature sense of concentration seemed to be missing. It’s not that anything was out of place, but that the inner spring – that tension which holds together even the most slowly played music – was absent. This is not simply a matter of tempos, which in this case were very broad. For example, the slowest Mahler Second Symphony I’ve ever listened to was by Klaus Tennstedt. He froze the music and achieved a suspension of time, which was not only breathtaking, but extraordinarily tense. I missed the tension in Eschenbach’s first movement. About 25 minutes in, it seemed to jump to life, but then slackened. I was similarly disappointed by the second movement. Then, in the third movement, everything seemed to come together. Eschenbach and the NSO players achieved a kind of Mendelssohnian charm and magic. The post-horn music, played over deliciously pianissimo violins, was mesmerizing and made for the most enthralling moments of the evening so far. The double basses achieved something similar in their extraordinarily soft and delicate introduction to the fourth movement. Eschenbach’s tempos continued to be slow but, no matter, his sense of concentration had returned. This level of engagement continued through Anne Sofie von Otter’s beautiful singing of the Nietzsche text and the chorus’s lovely delivery of the angelic message. The giant extended adagio of the sixth movement is a challenge for any conductor to pull off. Eschenbach was fully in his element here and I thought he rendered it more beautifully than he had the Adagietto in Mahler’s Fifth Symphony, which he played with the NSO in early May of this year. 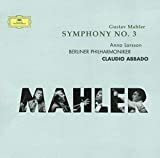 Since Mahler embraced and tried to fit the entire world into this symphony, every first desk player gets a chance to shine -- in fact, every section of the orchestra does. The NSO excelled in this respect. The brass were outstanding; the strings were very strong; the winds were delectable; and the timpanists spot on. The Kennedy Center Concert Hall audience was on its feet to give Eschenbach and the NSO a standing ovation. I can only presume it was for the last four movements. This concert repeats this evening. When is the Kennedy Center Concert Hall audience NOT on its feet to give Eschenbach and the NSO a standing ovation? I attended Saturday night's final performance. As I expected it was not as bright as the 2008 performance, it was a bit more contemplative, but not plodding, as I had feared.